CBBB wrote: Having noticed a CYTA advertisement on a Greek (not Cypriot) TV channel, out of curiosity I thought I would have a look at what our Government owned telecommunications authority charges in Greece compared to Cyprus. It is very interesting. In Cyprus just for internet at the maximum speed of 12Mbps/768Kbps the installation charge is €78.59 and the monthly fee is €72.90. 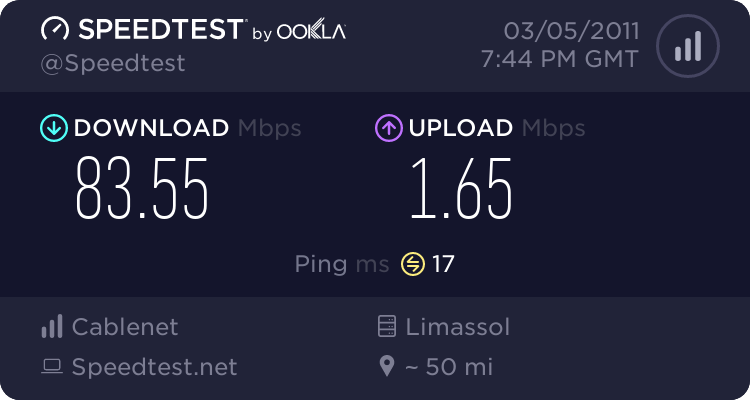 In Greece for internet at there maximum speed of 24Mbps/1024Kbps the installation charge is €30 and the monthly fee is €18. I won't go in to additional things that are offered in this package. So can someone explain why we who own the bastards get totally screwed, whereas the Greeks reap the benefits of us being overcharged? I know that, I am with Cablenet! These big numbers are often meaningless. There is no ISP that will give you such high bandwidth without doing traffic shaping. Sotos wrote: These big numbers are often meaningless. There is no ISP that will give you such high bandwidth without doing traffic shaping. How do those capitalists decieve the good hearted lovely people of the wild capitalist world! and why I am downloading HD movies in few minutes 1gb in 6 min. ISP´s in an effort to control & minimise network traffic sometimes “kindly?” introduce a “transparent” web proxy server for it’s customers. The “proxy” [cache] intercepts most of the requests you make to the Internet via your web-browser. For example, when you type in http://www.microsoft.com, the request for content is initially serviced by the ISP´s proxy server. If someone has recently requested http://www.microsoft.com, your content request is fulfilled by the ISP´s proxy server based on a page that has been retrieved previously. The idea is that, rather than go half way around the planet for your content, it’s faster to fetch it “locally” from the proxy server. The “official” line on a proxy server will likely be along the lines of “..improving speed for our customers” etc. Although this can be true in most instances, there are occasions when the reality is somewhat different. The basis for introducing “caching” into a network is primarily to assist ISP´s reduce overall bandwidth requirements (and therefore cost). 1. The nature of the page is “Static”. By “Static” we mean that content is non-data driven and does not change on a frequent basis. A good example of such a page is any page ending in “.htm” or “html” extensions. 2. The proxy server is configured correctly and has sufficient hardware & bandwidth resources to service all requests.